Casts are also available (postal service not available). 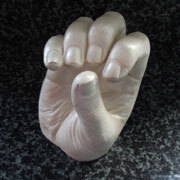 I come to you, to take a mould of the hand/foot and return the finished cast within 2-3 weeks. There is a choice of two finishes; Bronze or Opal Pearl. Discounts are available for second and subsequent casts.